The system of MODO Örnsköldsvik has provided the NHL with significant talent in recent memory, including Daniel and Henrik Sedin, Markus Näslund, Peter Forsberg, Alexander Steen and Victor Hedman. Additionally, it has provided the likes of Anders Eriksson, Tommy Salo and Anders Kallur, the latter being the first Swedish player to ever win the Stanley Cup. In 2012, defenceman Ludvig Byström can join that list. Byström made his début in MODO’s system in 2008 at the age of 14 with their under-16 team, playing three games, but it was not until the next year when he started to make an impact. During the 2009-10 season, he got to play 14 games for their team in the Swedish J18 Elitserien team. Byström scored four goals in those 14 games. Also, he got to play ten games in the J18 Allsvenskan, as well as five playoff games, registering one assist in the 2010 postseason. The 2010-11 season was a busy one for Byström. He played on four teams in four different leagues, all in the MODO organization. He recorded three assists in three games in the J18 Elitserien and then went on to play six games in the J18 Allsvenskan, scoring one goal and two assists. 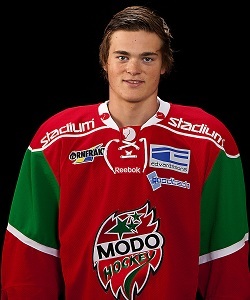 Byström graduated to the SuperElitserien to play for MODO’s J20 team. In 37 games, he recorded 11 points (one goal, ten assists) and accumulated 28 penalty minutes. Most remarkably, he was also given the opportunity to play one game for MODO’s top team in the Elitserien. Additionally, he played at the Memorial Tournament of Ivan Hlinka in August 2011, winning silver. If the 2010-11 campaign was not busy enough, 2011-12 was even more intense, especially since it is Byström’s draft year. Yet again, he spent the majority of the season with MODO’s J20 team, scoring 29 points (seven goals, 22 assists) and recording an incredible 101 penalty minutes, in 34 contests. He also played 20 games in the Swedish Elite League, tallying an assist, his first professional point. This was in addition to playing one game in the J18 Elitserien and one playoff game in the J18 Allsvenskan, a contest in which he registered ten penalty minutes. Byström’s 2011-12 season also included a trip to Canada. 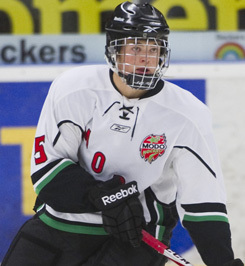 From November 7-13, 2011, he played at the World Junior A Hockey Challenge in Langley, British Columbia. His teammates included several other 2012 NHL Entry Draft hopefuls, including Erik Karlsson, Hampus Lindholm and Oscar Dansk. He tallied one assist in four games. Additionally, after the end of the regular season, he traveled to the Czech Republic for the World Under-18 Hockey Championships. He tallied one assist in six games, winning a silver medal. It should be noted that Byström is under contract with MODO’s J20 SuperElitserien team for the 2012-13 season, which may include yet another call-up to the Elitserien. He could also be highly considered for the Swedish under-20 team who hopes to repeat as gold medalists at the 2013 World Junior Hockey Championships, which will be held in Ufa, Russia. Byström has been lauded for his solid passing and his fluid skating ability, as well as the propensity to remain calm in stressful situations and the initiative to play with a physical edge. Conversely, he has been criticized for trying to do too much and it causes him to have mental lapses, causing him to be caught in his own end. That being said, however, Byström does have incredible upside that makes him a solid defensive prospect that many teams will find beneficial. * See “THW Close-Up” Section above. Willing to get involved physically. Needs to not try to do everything himself. Propensity to be caught in own end. Slapshot needs to get harder. One of Byström’s teammates over the last two seasons was his brother Anton, who is almost exactly two years older than he. Byström was born on Peter Forsberg’s 21st birthday. Byström was chosen 56th overall by Severstal Cherepovets in the 2012 KHL Draft. Byström’s EliteProspects profile (as of June 15, 2012) is 23rd out of the 100 most viewed player profiles on that site for players born in 1994. That is higher than fellow 2012 draft hopefuls Andrei Vasilevski (24th), Hampus Lindholm (29th), Radek Faksa (31st), Jacob Trouba (56th) and Esa Lindell (76th). Byström can be followed on Twitter: @luddebystrom. For more stories like this, please feel free to follow me on Twitter: @MargannLaurissa.